The Reliable Toy Company Limited of Toronto, Canada was founded in 1920 by Solomon Frank Samuels, later joined by his brothers Alex Samuels and Ben Samuels, had a long history of making quality doll products. 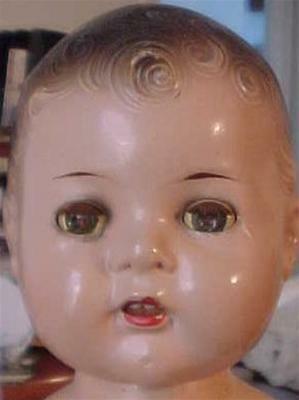 In the beginning Reliable imported bisque doll heads from Germany, put it on a body made from a USA company and assembled these into their own dolls. 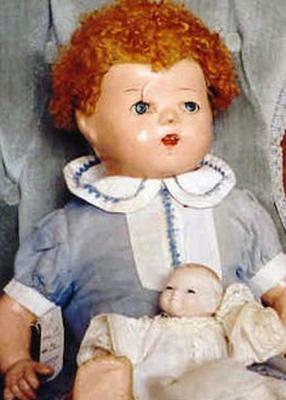 From 1922 until 1955 they began producing their own dolls, first made of composition, later of hard plastic and vinyl. 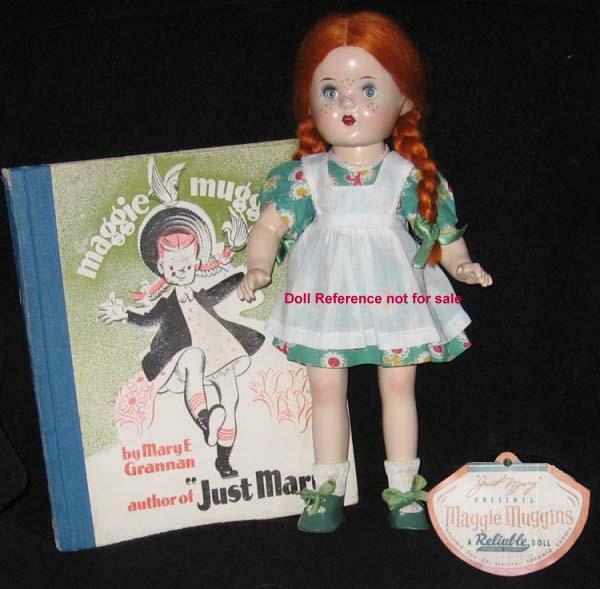 Reliable is best known for their Canadian style Indians and Mounties dolls, they also bought doll molds from other well known American doll manufacturer's, like the Ideal Toy Company Shirley Temple doll and produced their own version doll, that was not licensed for export to the USA. 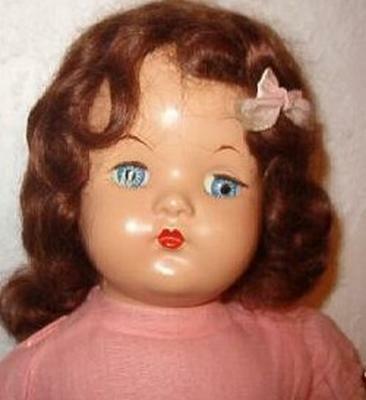 In 1959, Mr. S. F. Samuels founded the Regal Toy Company of Toronto who made plastic and vinyl dolls. 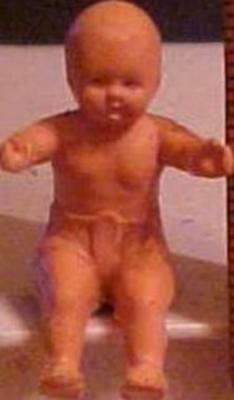 By 1985 Allied (Plastic Products) Group acquired Reliable Toys and in 1995 Reliable ceased doll production. 1933 Tousle head doll, 17"
1935 Reliable Chubby doll, 17" composition head, arms, straight legs, cloth body, blue tin sleep eyes, lashes, painted lower lashes, mohair wig, closed mouth. Mark: RELIABLE MADE IN CANADA. 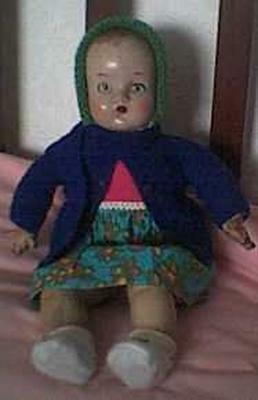 1935 Reliable Hairbow Peggy doll, 18" tall composition shoulder head and forearms, excelsior stuffed cloth body and legs, blue painted eyes, black line over eye, well defined molded hair with a hole for a hair ribbon, closed mouth, Mark on shoulder plate: A RELIABLE DOLL MADE IN CANADA. 1935 Reliable Hairbow Peggy doll, 13" tall, (shown on left) composition head and lower arms, cloth body and legs, has a place on the head to tie a ribbon. 1935 Hairbow Peggy doll, 18"
or a Mountie doll, 17"
1939 Clicquot Soda Eskimo doll, 14"
1939 Reliable Highland Laddie doll, 12-13" tall, all composition, jointed hips and shoulders, blue painted eyes, black line over eye, molded hair, closed mouth, dressed in his Scottish plaid attire of a; kilt, shirt, jacket, scarf, socks, shoes and hat, doll marked on back: RELIABLE MADE IN CANADA. There is also a companion doll named Highland Lassie. 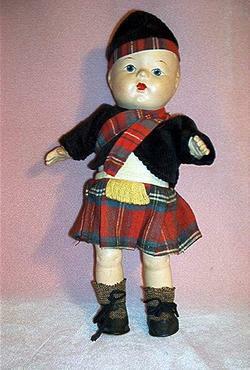 1939 Highland Laddie doll, 12-13"
ca. 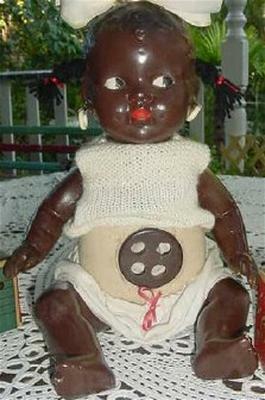 1940s Reliable Dollhouse Baby doll, 2" tall, all hard Plastic, wearing molded diaper, no moving parts, painted eyes and mouth, molded hair, doll mark Reliable Made In Canada on back. ca. 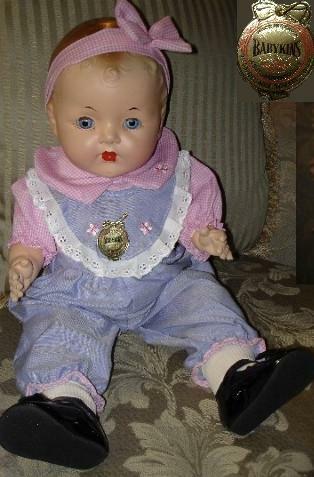 1940s Dollhouse Baby doll, 2"
1940 Reliable Dopey doll, 12" tall, composition head, cloth body, legs and arms, painted side glancing eyes Marked: Made under license from Walt Disney. 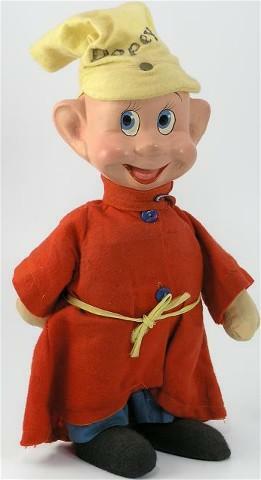 Dopey also came in a 20" tall size that had a moveable jaw and composition hands. 1940-1941 Reliable Eaton Beauty doll, 18" tall, all composition, straight limbed, jointed hips, shoulders and neck, blue lithographed metal sleep eyes, lashes, brown mohair wig, open mouth showing teeth. Marked on head: RELIABLE MADE IN CANADA. 1940-1941 Eaton Beauty doll, 18"
1941 Reliable Babykins doll, 20" tall, all composition, jointed hips, shoulders and neck, blue glassine eyes, lashes, painted lower lashes, brown molded hair, open mouth showing two teeth. Doll mark on head: RELIABLE MADE IN CANADA. 1941 Reliable Nurse doll, 24" tall, all composition shoulder head and forearms, excelsior stuffed cloth body and legs, blue painted eyes and upper lashes, molded light brown curls, closed mouth, wore a blue cotton dress with a navy cape and red trim. 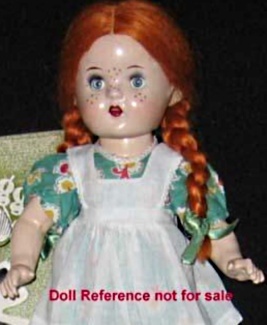 Marked on shoulder head: RELIABLE DOLL MADE IN CANADA. 1942 Reliable Army doll, 13" tall, composition shoulder plate head and arms, excelsior stuffed body and legs, blue painted eyes, light brown molded hair, closed mouth, dressed in kaki jumpsuit, belt and hat, socks and shoes. 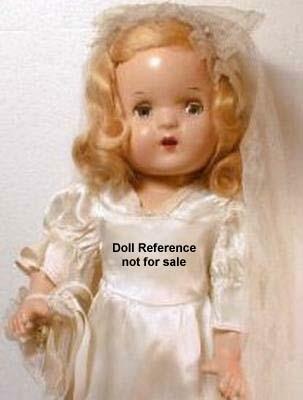 Marked on shoulder plate: RELIABLE DOLL MADE IN CANADA. 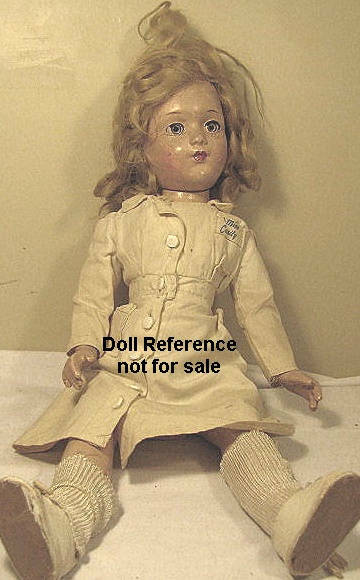 1943 Reliable Army novelty doll, 8" tall, all composition, jointed only at the shoulders with stationary legs, black painted side glancing eyes, painted upper lashes, short curly mohair wig, closed mouth, doll mark on body RELIABLE MADE IN CANADA. These standing dolls were made throughout the mid 1940s and came dressed in various costumes; Air Force, Nurse, Scottish Lassie, Scottish Laddie and others. 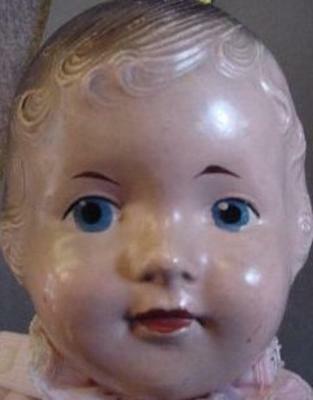 Chubby Kid, cherub or carnival type doll. 1943 Novelty Army doll, 8"
1945 Reliable Miss Curity doll, 18" tall, all composition jointed doll, sleep eyes, closed mouth, mohair wig, wearing a nurses uniform with her name on the front. 1945 Miss Curity doll, 18"
1947 Reliable Maggie Muggins doll, (storybook character by Mary Evelyn Grannan), 14" tall, all composition, red mohair braided wig, blue sleep eyes, painted freckles, open mouth, wore a turquoise cotton printed dress with white pinafore, shoes and socks, doll mark on back of head RELIABLE MADE IN CANADA. Photo on left courtesy of Jazzyjewls, photo on right is courtesy of Margaret. 1947 Maggie Muggins doll, 14"
1947 Reliable Raggedy Ann doll, 16" tall by Johnny Gruelle ©1947; with tags, I Love You, stamped over heart. 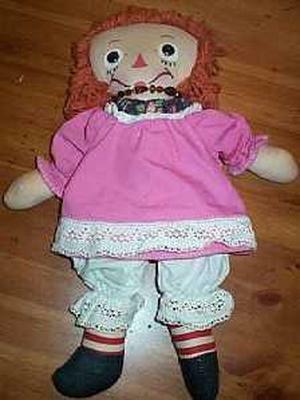 It is presumed a Raggedy Andy doll also produced. 1947 Raggedy Ann doll, 16"
1947 Reliable Scottish Girl novelty doll, 8" tall, all composition, jointed at the shoulders, stationary legs, black painted side glancing eyes, painted upper lashes, short curly blond mohair wig, closed mouth, dressed in her Scottish plaid attire, doll marked on head RELIABLE MADE IN CANADA. 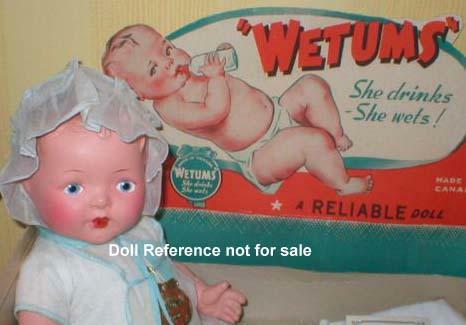 A Chubby Kid, cherub or carnival type doll with stationary legs. There is also a companion novelty boy doll named Laddie. 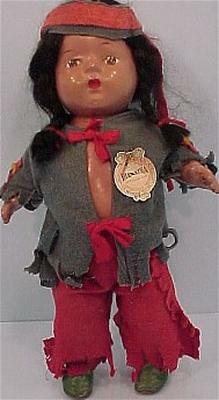 This same doll also came dressed as a Nurse, Indian girl, girl dressed in striped dress, Army & Air Force dolls. 1947 Scottish Girl doll, 8"
1934-1936 Reliable Shirley Temple doll, 18" tall, all composition body, jointed hips, shoulders, and neck, composition head with dimples; green sleep eyes, lashes, painted lower lashes; blond mohair wig; open mouth showing teeth, doll mark on head: SHIRLEY TEMPLE Cop. IDEAL N. & T. Co. Clothing Tag: A GENUINE SHIRLEY TEMPLE DOLL DRESS RELIABLE TOY CO. LTD., along the side, MADE IN CANADA. 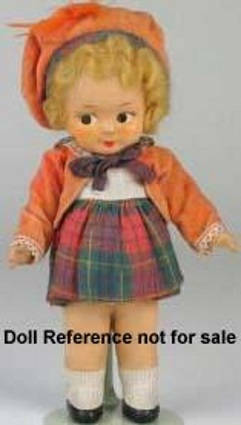 1948 Reliable Cuddles doll, 22" tall, composition head, arms and straight legs, cloth body, blue metal sleep eyes, lashes, painted lower lashes, blond molded hair, closed mouth, doll marked on head: A RELIABLE DOLL MADE IN CANADA. 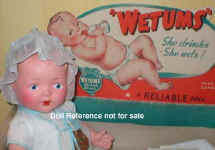 Also Reliable; Baby Joan doll, Baby Jean doll, Baby Gloria doll, Baby Marilyn doll, Baby Precious doll, Military dolls and Toots doll.